Christmas also happened to fall in my 27th week of pregnancy – token bump picture coming up….. 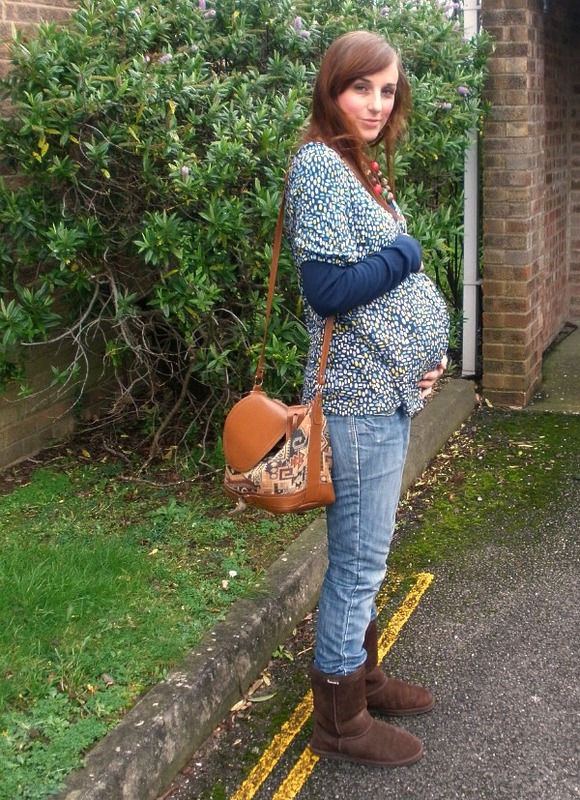 I still refuse to even entertain buying maternity clothes – I rarely buy anything new anyway, and the thought of spending such an obscene amount of money on (let’s face it, pretty hideous) clothes that I would only wear for a short time is enough to give me a nervous twitch. I’ve bought a few stretchy dresses and long vest tops, but so far nothing that can’t be worn after Madam makes an appearance. As you can see, the third trimester has completely taken its toll on my ability to shoehorn myself into any remaining vintage – and throbbing, swollen feet mean that nice shoes are pretty much off the agenda. Sigh. Roll on Spring, and little sandals, that’s what I say. The run up to Christmas in our house was a flurry of baking (assisted greatly by The Boy – although I strongly suspect more decorations made it into his mouth than onto the baked goods)…. 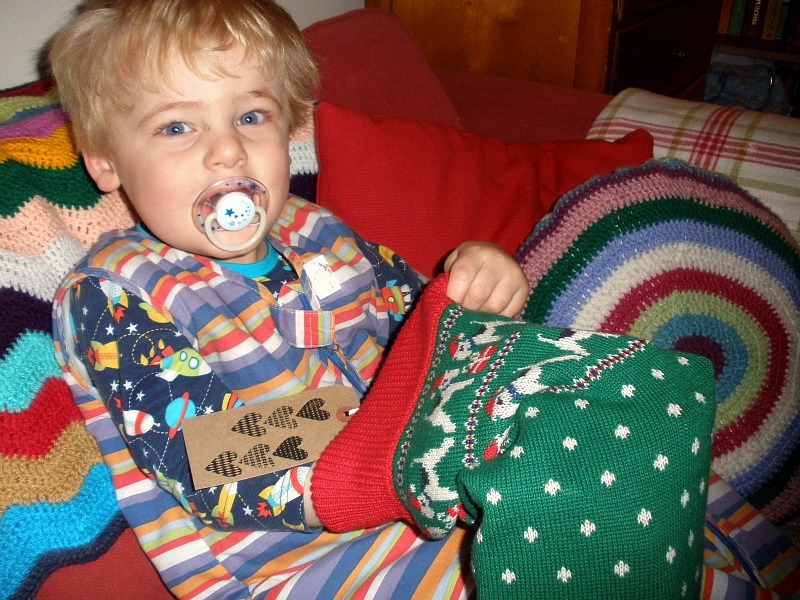 ….and making, both of handmade gifts and decorations…. This garland never actually got finished…. I was ever so chuffed with the handmade gift tags – despite getting the stamp from Hobbycraft, and the tags from WHSmiths. Ahem. I had the grand idea of making teacup candles…. never again. 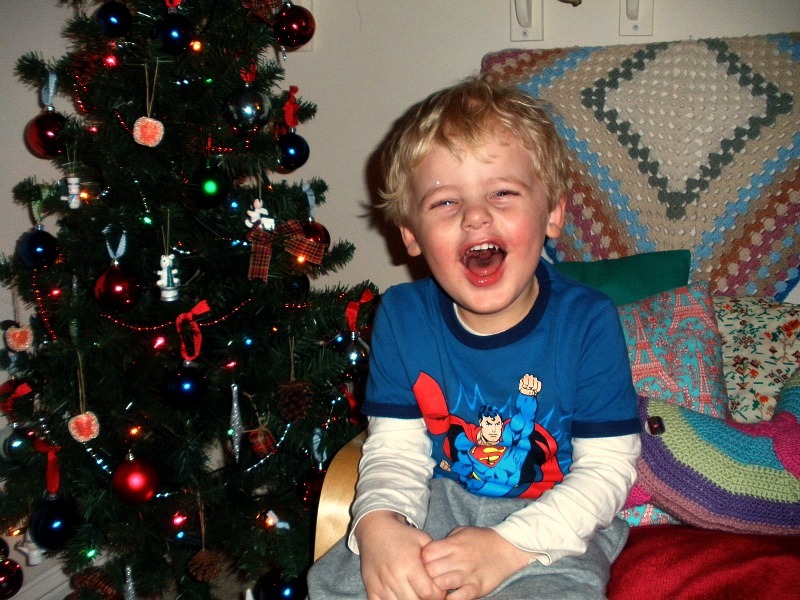 The Boy is three now, and this is the first year he’s actually understood what happens at Christmas. As you can tell, it pleased him greatly. I was lucky enough to receive some really lovely gifts from friends and family this year – books that I’ve lusted after, candles, scarves… I felt incredibly chuffed with my lot this year. The Boy was thoroughly spoiled by all my lovely friends as well. Lucky little man! As much as I enjoy the festive season, I’m now itching to take the decorations down and get my teeth well and truly stuck into the new year. We had a truly lovely Christmas, and now I’m ready to follow it up with more of the same in 2012. Lovely photo's and lovely decs! we are almost exactly at the same point pregnancy wise- i'm ow 29 weeks, due 22nd march! Thanks lovely!Eeeek, are you nervous? I am, and I've done it all before! Have you found out whether it's a boy or a girl? We're buying hardly anything this time, although I do really want to get a new sling – I've got a Moby wrap (or something similar), but want something a little bit easier to construct!